Everyone has a secret. Well, mine isn’t exactly a secret. I just haven’t got around to sharing my passion for history and almost anything retro. This hasn’t been a conscious omission. I’ve simply been writing about other stuff. Besides, it’s a bit like stating the obvious. You see, when you visit our place, there’s a Morris Minor parked out the front. There are rows of antique bone china tea cups which have broken out of the display cabinet and have started to wander. Old, black & white family photos peer through ornately carved, antique wooden frames and my computer is perched on top of an old oak desk with a gorgeous wood grain finish. Being the eternal good Samaritan, I’m forever salvaging the past from our local charity or “op” shops as we call them. Indeed, you could say that I’m quite the “archaeologist” or even that I’m “kind to the homeless”. While I do have dogged persistence, most of my “finds” are beyond coincidence and were clearly: “serendipity” or “meant to be”. I had to take them home!! Anyway, while my greatest archaeological weaknesses is vintage tea cups closely followed by illustrated books and cookbooks, another love of mine is collecting old magazines, which is quite odd in a way because I rarely buy contemporary magazines at all. My most cherished magazines are copies of the Australian Women’s Weekly dating back to the 1950s, which I picked up from an antique shop in the Queensland country town of Marburg, where my mother spent some years as a child. I love really getting into how people lived in “the olden days”. Recently, I came across a new find for my collection. 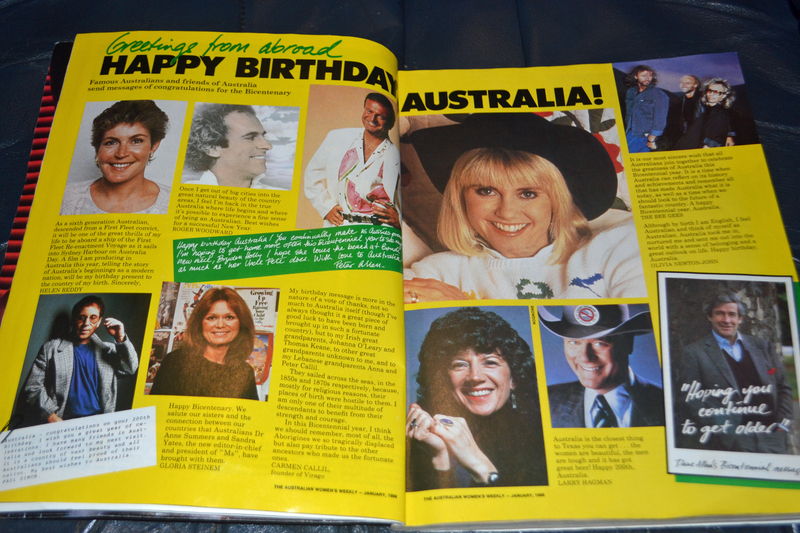 It was an Australian Women’s Weekly dating back to January 1988. That’s now 24 years ago. While it is not as old as my other editions, it was the “Bicentennial Souvenir: Special Collector’s Edition”, which celebrated Australia’s “200th Birthday”. The Bicentenary was a very special time in Australia’s history when we really thought about our identity as a nation and there were all sorts of special events as well as much sorrow. Personally, 1988 was also a very special year. You see, I’d left school at the end of 1987 and you could say life began in March 1988, when I walked through the gates of Sydney University and discovered a social whirl like none other. Aside from having my heart broken by my high school sweetheart, 1988 was a jolly good year! While the magazine has much to say about the bicentenary, I’ll get to that after further research. I’m sure you can appreciate that any national celebration of that magnitude was “complex”. Meanwhile, I just want to bask in the light of the glorious 80s and soak up the social, fashion and technological changes and let the good times roll back. Charles & Di: a great modern tragedy. This, of course, is one of the disadvantages of getting published. Your words really are set in stone and can indeed come back to haunt you. I came across an interesting feature called “Women of Style”, where they interviewed Australian style icons about their views on Australian fashion. Not unsurprisingly, Lady Sonia McMahon, wife of former Australian Prime Minister Sir Billy McMahon and mother of actor Julian McMahon, was interviewed. 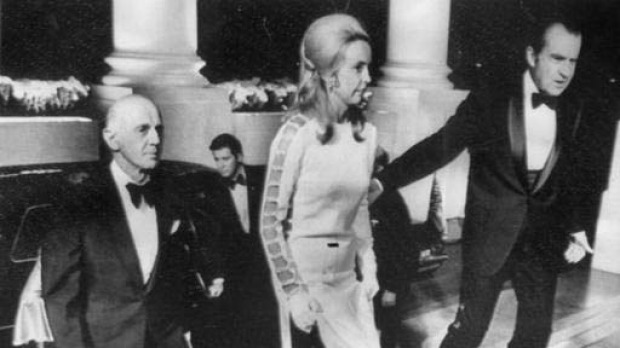 Lady Mc Mahon had climbed to fashion royalty in 1971 when, as the wife of Australian Prime Minster Sir Billy McMahon, she wore “that dress” to a reception held by US President Richard Nixon at the White House. The daring dress was split both sides to the armpits though held together by rhinestones about two centimetres apart from the waist up. While the dress appears quite revealing, it was actually lined with a pantyhose-type, flesh-coloured fabric. Sonia McMahon in THAT dress at the White House. 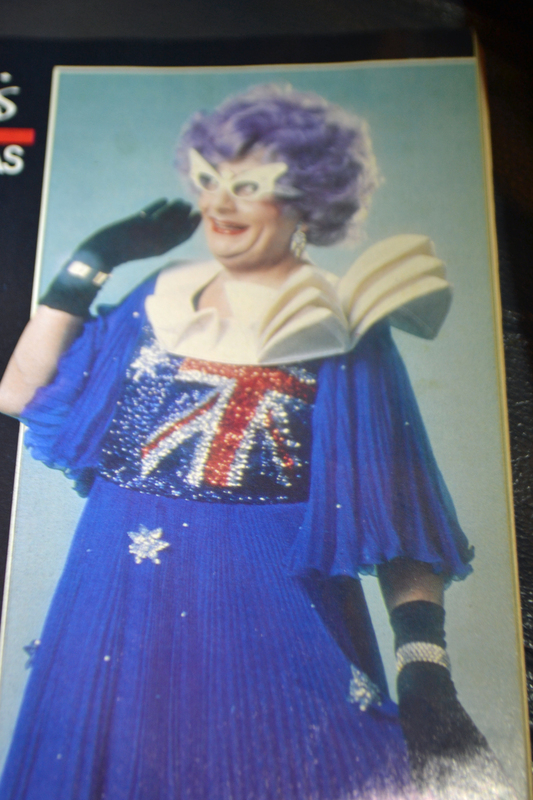 Only Dame Edna could manage to incorporate the Auistralian flag and a 3D version of the Sydney Opera House into a frock. In contrast to Lady McMahon’s classic elegance, Dame Edna is wearing a garish canary yellow outfit with two koalas up a gum tree. As if that wasn’t bad enough, she’s also pictured wearing a blue dress with the Australian flag sequined on the bodice. But wait!!! It gets worse. I just noticed that the white starchy collar is actually the Sydney Opera House. Yikes!!! Hasn’t she ever heard that less is more? Oh my goodness!! I can feel some kind of severe anaphylactic reaction setting in. Oh! I mean… there’s the pink hair, purple hair and I’m not even going to discuss the glasses…Oh my goodness. There just aren’t enough superlatives to do Dame Edna any kind of justice whatsoever!! She just has to be the most truly cringe-worthy, “national symbol” EVER!!!!! 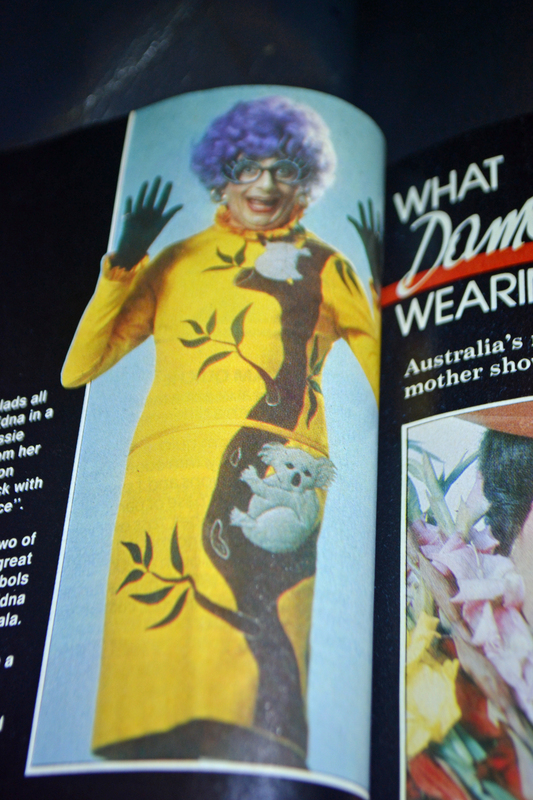 The big question I have is this: Who allowed Dame Edna to leave the country dressed like that and why on earth did a magazine like the Australian Women’s Weekly publish the evidence? Quite frankly, someone should have grabbed Dame Edna by the horns and told her in no uncertain terms: “Go to your room. You’re not leaving the house looking like that!! !” I know fashion was a bit out there in the 80’s but I’m flabbergasted. Indeed, when it comes to managing Dame Edna stronger measures would have been required. The fact that she ended up overseas dressed like that and representing our country makes her fashion choices a matter of national security. She was destroying our National Credibility Rating (NCR). What with those crazy outfits, the pink and purple hair and all her “hello possums” and parading around as Australian royalty, she was a national embarrassment. I understand that customs usually stop undesirables from entering into a country but couldn’t they have done something to stop her from getting out??? Anything!!! Of course, there are the fashion police. If ever there was a case demanding their expert attention, this was it. They should have locked her up and thrown away the key! absolutely!! Sentenced her to life imprisonment rather than let her flaunt her peculiar fashions overseas and in The Weekly. Yet, as much as Dame Edna has that incredible cringe factor, for some strange reason, we still love her even though we want to hit her with the nearest fly swat!!! Gee, I hope Dame Edna never gets hold of Lady McMahon’s “dress” from the Powerhouse Museum. Seeing the epitome of kitsch dressed as the epitome of style would be the outrage to end all outrages…especially as I doubt Dame Edna has ever shaved her legs!! “Your priorities do change when you have a child. Not your personal priorities but the fact that your lifestyle has to accommodate another person.You have somehow to work out how you’re going to make that person happy and contented so, yes, it did- or is- taking a lot of thought and I’ve no intention of stopping work at all. My work is very important to me and it makes me a complete person. I don’t think I’d be very successful at just sitting at home,” Jana said. I personally have mixed views about Jana’s comments. I wholeheartedly support her desire to combine motherhood and career but her assertion that full time parents are just “sitting down” is poorly informed. They’d be lucky enough to sit down long enough to get through a cup of tea uninterrupted. Another point of interest was a joint photography feature between the Australian Women’s Weekly and Fuji Film: How to Take Perfect Photos…Every Time! Computers 1980s style…a terminal connected to a mainframe. However, as much as things have changed since January, 1988, some things have also stayed the same. 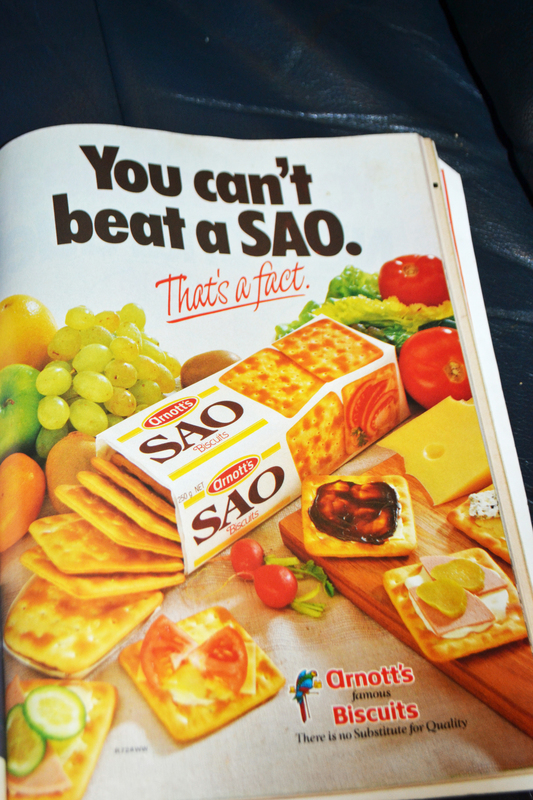 Thank goodness for Sao biscuits!! Thank goodness some things never change!! I don’t know if I really miss the 80’s but wouldn’t it be great to be 18 again for just one day!! Yes, I’d have a lot to say to my 18 year old self!! What about you? 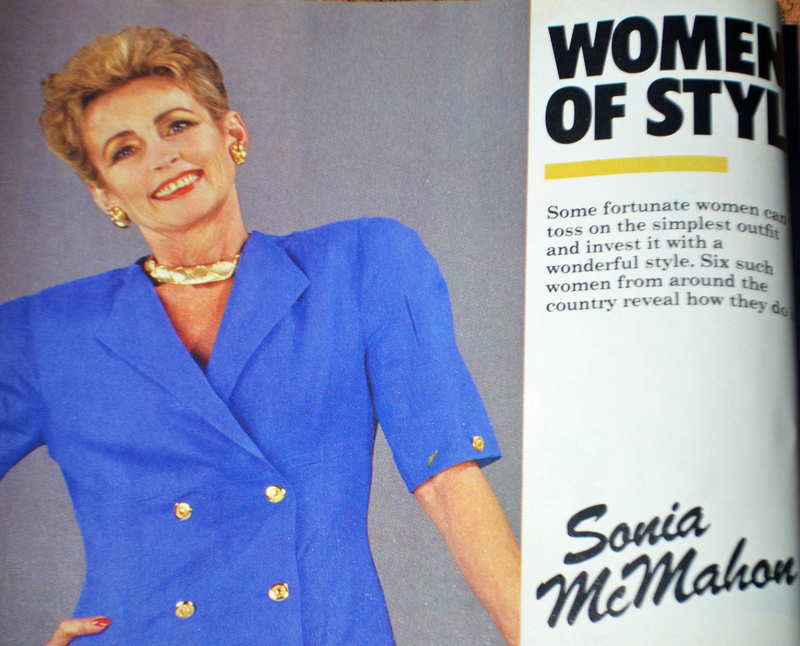 The Australian Women’s Weekly, January, 1988. 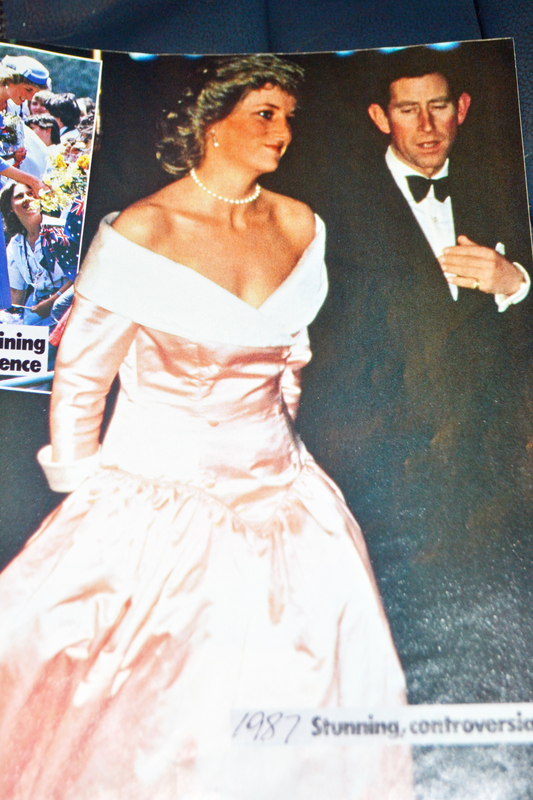 This entry was posted in Australia, Humour, Uncategorized and tagged 80s, Australia, Australia Day, Australian, Australian Bicentenary, Australian fashion, Australian flag, Australian History, Australian Women's Weekly, Barry Humphries, Bicentenary, career, child care, collecting, culture, Dame Edna, Dame Edna Everage, declutter, eighties, fashion, fashion history, feminism, hair styles, history, Invasion Day, Jana Wendt, kids, koala, Lady Sonia McMahon, magazines, McMahon, Morris Minor, motherhood, nationalism, Nixon, photography, possum, Prince Charles, Princess Diana, retro, social history, Sydney Opera House, time travel, university, vintage, White House, women, women's history, youth on January 30, 2015 by Rowena. This young man, Caillou Pettis (below) is a big fan of the famous American singer-songwriter, Taylor Swift. Unfortunately, Caillou has been a victim of bullying on a daily basis and so he decided to write a message, to Taylor, describing his predicament. Taylor Swift is so amazing. I love everything she does, so much, and I am so glad that she cares about the fans. Fans are everything to Taylor. She cares about them. I’ve been a fan for as long as I can remember. My name is Caillou Pettis, and I love you, your fans, etc. Your songs are so sweet, and they’ve got so much meaning in every lyric, and it really makes me smile to know that a celebrity with tens of millions of fans replies to fans. It’s incredible. This entry was posted in Uncategorized on January 28, 2015 by Rowena. Dear daughter of mine. You reached a milestone tonight. Every dad dreads this day. And, I must admit, I am very much like every dad. So, to ease the sting of the first date and assure you were treated like a queen, I took matters into my own hands. The good news is you enthusiastically accepted. No doubt my probability of success was buoyed by the fact that you believe I am a superhero, capable of throwing your giggling, 36-pound body into the air to unspeakable heights, and catching you again before you konk your head on our food-splattered wood floors. And who wouldn’t want to date a superhero? On the 28th of January 1754, in a letter to Horace Mann, eighteenth-century English author Horace Walpole coined the word serendipity in the English language: “I once read a silly fairy tale, called The Three Princes of Serendip [the ancient name for Ceylon, or Sri Lanka]: as their Highnesses travelled, they were always making discoveries, by accidents and sagacity, of things which they were not in quest of: for instance, one of them discovered that a mule blind of the right eye had travelled the same road lately, because the grass was eaten only on the left side, where it was worse than on the right? Now do you understand Serendipity?” In its current usage, serendipity means a fortuitous discovery, a positive chance happening. Dong! Dong! Dong! We’re back to the real world. 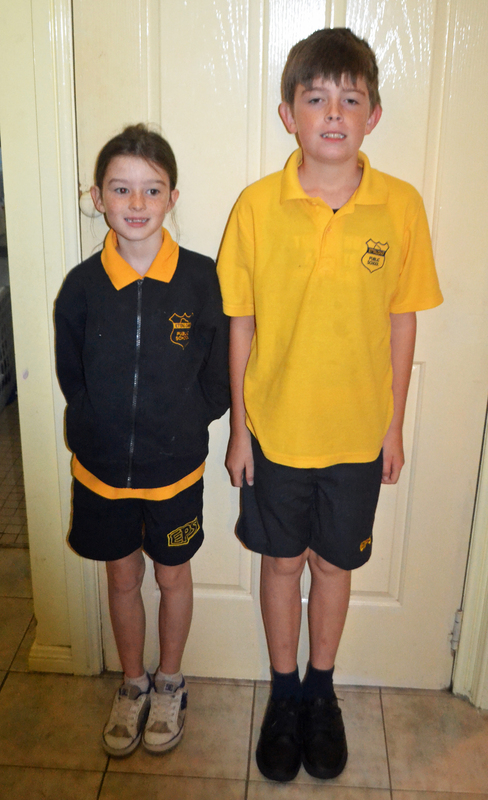 Getting the kids off to school for the start of another year, is tricky at the best of times. However, when your life is complicated for whatever reason, trying to get your little peoples to school on time with all their paraphernalia on the first day becomes, or at least appears to be, Mt Everest…particularly if “catastrophise” is your middle name. Of course, to make matters worse there’s always that parent who has literally licked ever hair on their preciously child’s perfect little head in place just to ensure your child looks completely and utterly neglected like some raggamuffin orphan out of Oliver or Annie. At times like this it’s easy to feel that no one understands that your children, your family and even your precious dogs have indeed been through the spin cycle and haven’t exactly emerged with all the right bits in all the right places and that you’re just thanking your lucky stars that they even got there at all. Well, actually, things went a lot better than that but that was my concern. After all, this house is where Murphy’s Law, Mrs Murphy’s Law and Rafferty’s Rules all fight it out to the death. However, it could be worse. This time last year, I was undergoing chemotherapy to treat my auto-immune disease, dermatomyositis. I can’t even remember how the kids went to and from school on their first day last year but I do know that they soon found their way into before and after school car, which later cut back to after school care and when funding magically cut out after 3 months because, as we all know, parents only get sick for 3 months and then magically resurrect from near-death. Well, that’s how it is in Australia anyway. Thank goodness for friends because a friend was giving my kids lifts at least two mornings a week all of last year. Even though the broken foot is still healing and I’m only just back to driving locally, I’ve decided to tackle the new school year head on like a bull charging at a gate and have decided to take responsibility for getting our kids to and from school even though my mobility is far from ideal. I’m walking with my foot in a boot and my mobility is problematic anyway due to muscle weakness. While I am perfectly justified in getting assistance, I wanted to get involved with school again so we can stay with the program. 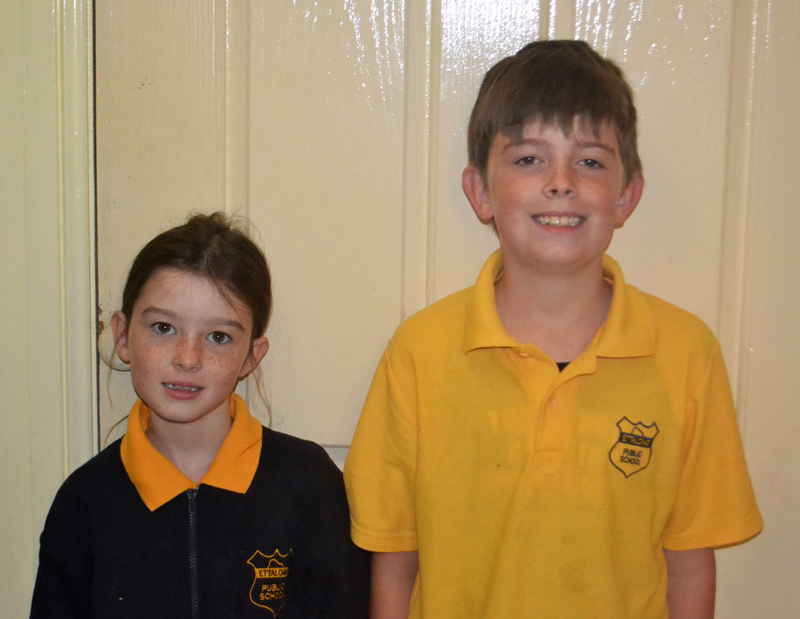 The kids all dressed and ready for school. It was raining outside so we didn’t get our usual shot at the front door. The other problem I have when it comes to getting out the door is that the kids almost always ignore me. LIke so many kids, for some reason they completely ignore Mum and resolutely do their own thing, which makes getting them anywhere on time difficult. While you might say that I need to take control and be the parent, I often have trouble with my voice so it can be a struggle to speak. I struggle to move and so it doesn’t take much for the kids to completely out manoevre me and get away with blue murder. This was where having my friend taking them to school was particularly handy because they didn’t want their friends seeing them in their PJs. The Deputy Principal has also told me that she is quite happy to accept the kids in PJs and they know that. They may think they can run rings around me but they know they don’t stand a chance with her and they quickly shape up. While it is one thing to make all these decisions, which really do fall under the same heading as New Year’s resolutions. They are doomed to fail without any corresponding plan of action and a fairly detailed one at that. The irony with most of these supposedly difficult changes which we struggle to make is that we already know what we need to do. We probably also know how to do it. We just lack the discipline and commitment to see it through. Stick with it. I understand that it takes 6 weeks to change a habit but day one or at least the start of day 1 has exceeded all my expectations. I have drawn up a daily check list for the kids which is laminated. Every day, they tick off their jobs as they do them and only once they’ve done everything on the last, will they get access to electronic devices. Devices go off at 8.20 and we are in the car and driving off at 8.30 AM. School starts at 8.55AM and school is only a five minute drive and so they get in plenty of play time with their friends before school. The funny thing about the check list is that the same kids who were protesting to do the dishwasher, never make their beds and forget to brush their teeth in the mornings did all of these tasks without nagging or complaint. It’s a miracle worker and I’ve known the check list is a miracle worker and yet I keep forgetting to update it. This means it’s been about 2 years since we last used it and believe me, there has been a lot of angst and heartache in between. Quite simply, I do a list up of everything the kids need to do before school and their afternoon/evening routines and then have a tick column for each day of the week. In the past, I’ve printed a list our for each week and pasted it in a book but laminating the list means they can tick it with a whiteboard marker and you can wipe it clean each week and start over. I have used a bit of colour, highlighting important times like leaving for school and I have also included a row for after school activities so they know what they have on as well. 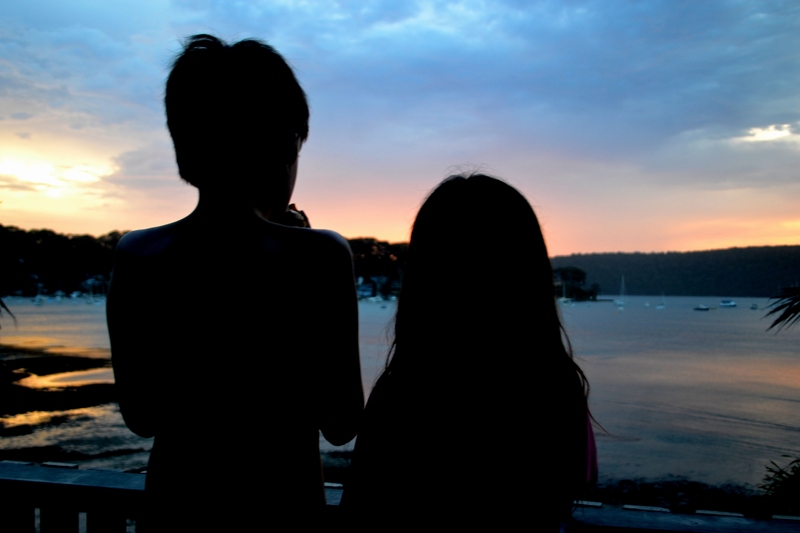 They are about to turn 11 and 9 so should be fairly self-reliant and not be needing constant reminders from Mum and Dad anymore.I am particularly conscious that our son starts high school next year and really needs to get organised now in advance. Just because Mum’s the papparazzi, that’s no reason the kids have to pose like supermodels. I was very lucky to squeeze a second shot out of my son and they refused to interact, relax and insisted on this kangaroo stunned by the headlights look. I am quite thrilled that everything went almost too smoothly and that we pulled out of the driveway right on 8.30 as planned and I was back here sitting at my desk at by 9.00 AM armed with my special cup of tea and home made Banana Macadamia & Blueberry Muffin. 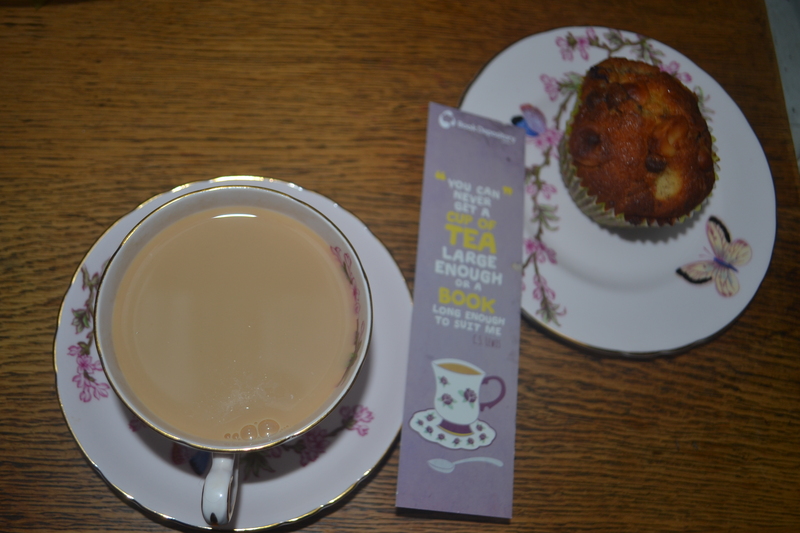 A relaxing cup of tea and home-made banana muffin after dropping the kids at school early. “You can never get a cup of tea large enough or a book long enough to suit me”. However, to be perfectly honest, the early morning start has been a bit of a doozy so I think I might just nip back to bed for a little Nanna Nap. I don’t know if I’ve mentioned before that I’ve somehow ended up on Western Australian time, which is 3 hours behind Sydney and what with the holidays and all, have been staying up way too late and sleeping in and I’m pretty sure Geoff has been hanging out for this morning when the night owl was needing to surface at 6.30AM and get back to the human race. 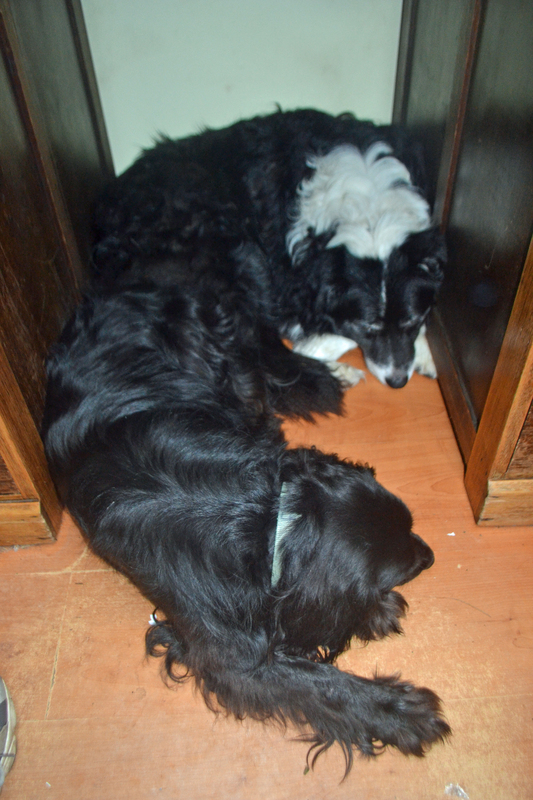 Dogs sleeping under my desk. While the rest of us have had to get back to the real world, the dogs are on a perpetual holiday. As we all know, Rome wasn’t built in a day. Please wish us luck and for anybody experiencing the terrible snow storms, we are thinking of you and praying that you are safe and sound. This entry was posted in Australia, Parenting, Personal Development, Uncategorized and tagged anxiety, Australia, back to school, Be Prepared, CS Lewis, cup of tea, dog, dogs, family, kids, mindfulness, mom, mum, New Year, organisation, parenting, perfectionist, relaxation, school, Sydney, tea, time management, work on January 28, 2015 by Rowena. The kids farewell the summer holidays. This being the day before tomorrow (i.e the last day before school goes back), something was guaranteed to go wrong. Not to disappoint me, the kids who know drinks don’t go anywhere “within cooeee” of the computers, spilled their fruit smoothie splat right onto the keyboard. That’s right. There’s now soy milk and fruit oozing around the keys in a thick, pink, oozy sludge…not to mention honey and all that Natural Tasmanian Yogurt all the way from the Tamar River!!! 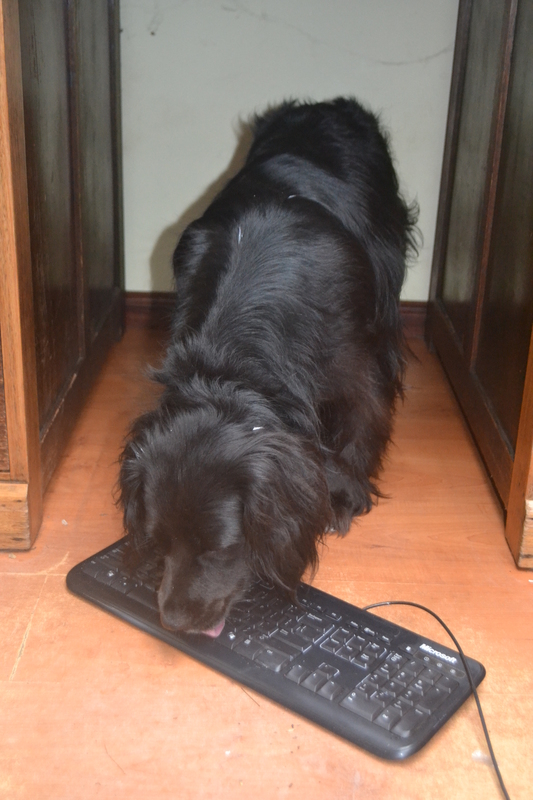 I’m in two minds about having the dog lick the keyboard but I know enough about IT to know that drinks in the keyboard is pretty much a terminal event. That keyboard was looking so much like a dodo, that a bit of dog slobber wasn’t going to be fatal and there’s always disinfectant. Besides, the keyboard is hardly a dinner plate. At least, it shouldn’t be!! Lady must have taken a few lessons from Geoff in IT maintenance. So far so good. I haven’t tried plugging the keyboard back in yet and it’s now sitting face down on my desk until Geoff gets home. Hmm…After Lady’s efforts, I’m thinking she could get a job in tech support and Geoff could stay home and sleep all day. Indeed, Geoff would look quite a sight lying on his back next to the couch with his arms and legs in the air looking for a tummy scratch! I don’t think he’d be complaining. I don’t know what dog slobber is going to do to the overall damage but either way, the keyboard is going to need a good clean and my nervous system is going to need a good sedative…and we’re still not ready for school yet!! Something tells me that it will be easier to get ready for “back to school” once the kids are already back at school!! This entry was posted in Dog-Our dog Bilbo, Humour and tagged back to school, comedy, computer, computing, disaster, disaster recovery, dog, dogs, funny, germs, humour, IT, kids, mom, mum, Not Happy Jan, parenting, school holidays, spilled milk on January 27, 2015 by Rowena.